Magog, QC, June 5, 2018 – Camso, through its Solideal On-Site Service operation in EMEA, brings to the UK market a pneumatic Tyre Puncture Protection Program to eliminate flat tyres while providing maximum uptime to its customers. “Efficiency and cost control are the focus of today’s fleet management teams. Equipment downtime due to flats on any type of air-filled tyre is unplanned and costly,” says Steve Ridley, Sales and Operations Director UK for the service operation of Camso. “This cost comes from having to purchase replacement tyres and through the loss of productivity when trucks are not running,” he continues. Solideal Nature: an economic and environmentally responsible choice with recycled oil-based tyre fill that keeps millions of pounds of used fill out of landfills each year. Solideal Pure: a premium filling solution which uses pure liquid virgin fill to maximise traction, comfort and tread life, resulting in increased value. 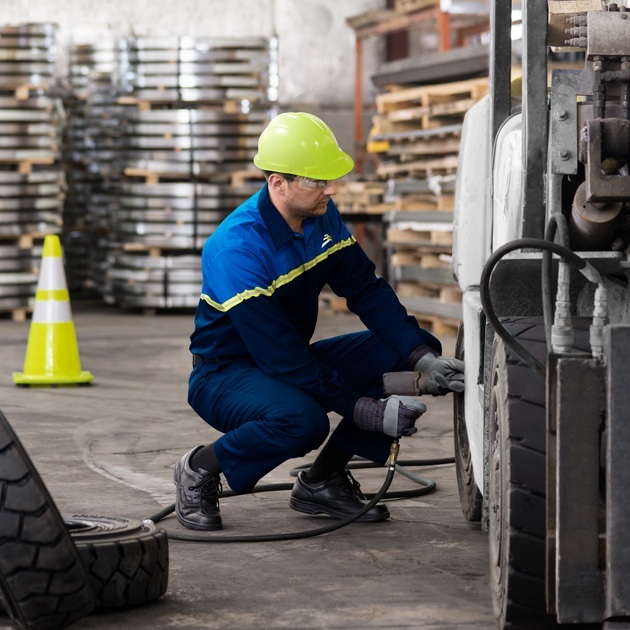 Solideal On-Site service is ISO9001 NQA where experienced technicians work to a high standard of safety providing tailor-made, convenient, forklift tyre solutions at the best price per hour. Over and above tyre fill, SOS offers application-specific reviews and product recommendations, wheel exchange and in-depth fleet analysis. With a national service coverage across the UK, Solideal On-Site Service has the most comprehensive footprint in the industry both regionally and nationally, bringing on-site service solutions to its customers like no other in the industry. Solideal On-Site Service specialisation creates improved levels of performance leading to greater value for dealers and customers alike. Customers can have immediate access to a product expert by using the tyre fill direct line : 01785 283330 option 2, or by visiting solideal.com. Camso, the Road Free Company, is a world leader in the design, manufacturing, and distribution of off-road tyres, wheels, rubber tracks and undercarriage systems to serve the material handling, construction, agricultural and powersports industries. It employs more than 7,500 dedicated employees who place 100% of their effort on 11% of the global tyre and track market—the off-road market. It operates advanced R&D centres and manufacturing plants in North and South America, Europe and Asia. Camso supplies its products to leading original equipment manufacturers (OEM) under the names Camso and Solideal and distributes its products in the replacement market through its global distribution network.